Riots in Kinshasa (file photo). Neither an NGO nor a political party, Lucha has mobilised in innovative ways to ensure young people's voices are heard in DRC's tense environment. Five years ago in the eastern Congo, a group of friends from the University of Goma were rushing home in the heavy rain when their journey was interrupted. They saw that the streets ahead were flooded and they couldn't pass. Furious that the government could not provide even the most basic drainage systems, they decided there and then to take matters into their own hands. As they sheltered from the downpour, they founded a new kind of grassroots movement that would push for reforms. They called it Lutte pour le Changement ("Struggle for Change"). No one seems completely sure whether this origin story is true or not. But since its founding, that organisation - now better known by its abbreviation "Lucha" - has become one of the greatest threats to the country's political status quo today. Neither an NGO nor a political party, the movement positions itself outside traditional civil society. It organises non-violently at both the local and national level. And it has taken part in organising widespread protests, sometimes leading to high-profile arrests of its members. It turned five years old this month. Lucha pushes for reform all the way up to the presidency, but it most actively engages at the community level. Its local activities generally take the form of popular education or protests. In Goma, for example, Lucha has organised sit-ins to call for increased access to clean water, pushed for the construction of a road to Sake in the face of repeated construction halts, and protested mismanagement in the banking sector. Through these actions, it has managed to thrust important issues onto the political agenda. "This is an important organisation in terms of popular consciousness", says Jason Stearns, director of the Congo Research Group, though he adds that "it is not very big in terms of capacity for mobilisation." However, while it remains young and relatively small, Lucha is growing and spreading with each day. The movement now has branches in all major Congolese cities, with each seeking to improve its own community in addition to coordinating with other Lucha divisions on wider-ranging issues. The movement has approximately 1,000 active participants across the country, though membership is often fluid and informal. This followership is impressively gender-balanced for a major Congolese organisation and is largely made up of people in their 20s. Most supporters are educated and work in the formal sector, suggesting the organisation is not particularly diverse in terms of class. But the group notes that some demographics are harder to mobilise than others. With 63% of the country under 25-years-old, young people represent a major political force in the Democratic Republic of Congo (DRC). Lucha is the largest of the organisations harnessing this momentum and works alongside other youth groups such as Filimbi and Quatrième Voix. For many members of Lucha, it is the group's unique structure and ethos - which stands in stark contrast to the frustrating mode of elite politics that has long dominated the country - that attracts them. "For once I feel like there are people who think like me, who believe that they are the first actor of the change they want to see," says Lucha member Soraya Aziz Souleymane. "It's not about money. It's not about receiving funds from USAID or DfID or whatever. It's really leadership with values, and I think we lack that." While Lucha's main activities may be focused locally, it is its national-level work that has gained it the most attention. As it has become clear over the past couple years that President Joseph Kabila is unwilling to step down despite his official mandate expiring in December 2016, members of Lucha have played a central role in pushing back. 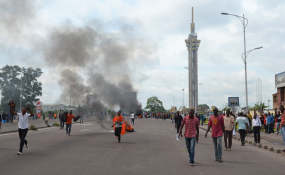 In January 2015, a wave of protests against perceived attempts by Kabila to extend his rule led to 43 deaths. That March, the government raided a pro-democracy workshop in Kinshasa and carried out mass arrests. Among those detained were Lucha members Fred Bauma and Yves Makwambala, who were held for nearly a year and a half before being freed. During that time, their plight attracted the attention of international human rights bodies and Western media, who called for their release and helped raise Lucha's profile. In the protests that continued through 2015 and 2016, dozens more demonstrators were killed by police and more Lucha members were arrested. As 2017 approached and Kabila still showed no signs of leaving power, Congo braced itself for more violence. But on 31 December 2016, the Catholic Church brokered a deal between the ruling party and opposition. It agreed that elections would be held by the end of 2017, after which Kabila would step down. This averted greater turmoil at the time, but recent events suggest that the Kabila is unlikely to honour the agreement. Little headway has been made in arranging elections. The opposition accuses the president of violating the deal in the way he created the transitional government. And the Catholic Church has pulled out of the negotiations, claiming insufficient commitment to the deal from both the ruling party and opposition. In this tense and uncertain environment, Lucha continues to mobilise. This March, for instance, activists in Lubumbashi staged a sit-in protest outside UN offices demanding it intervene in the implementation of the 31 December agreement. In April, members marched in Kinshasa against the filthy state of the capital. 23 protesters were arrested and told by the city's governor that they could only be released if they removed their Lucha-branded t-shirts. How the youth movement will continue to keep up pressure and build momentum over the coming months remains to be seen. Lucha will need to continue to manage the tricky balance between engaging in politics and preserving its integrity. According to Stearns, "some members of Lucha internally wanted to become a political party, wanted people to run for government. That was not the position of the central committee." Indeed, members such as Souleymane express deep misgivings about the Congo's more typical modes of political engagement and the individuals within them. "We do not trust the political opposition. We don't trust them at all. They purposely sabotaged the momentum we had to kick Kabila out," she says, believing that the opposition saw currying favour with Kabila as an opportunity for political and financial gain. "We also don't trust the traditional civil society." This suggests that Lucha is destined to remain outside of conventional spheres where it is better protected from corruption and co-optation. This also means, however, that its influence in the highest echelons of power will remain limited. For example, the movement demands that Kabila steps down, but staying out of opposition politics means that the next president will also be a figure Lucha does not trust. For the movement though, this is not a contradiction. Instead, they see their work as part of a long-term process of building government accountability. "Our hope is not that the next president will bring terrific change. It will not solve all the social issues Congo has," says Souleymane. "We are not naive. We know this will not happen just after this next election. "Maybe in 50 years, because leaders are becoming more accountable, we will see changes on the ground, and in 50 years we will be on our good way to development." Despite their recognition of the challenges ahead, Lucha's young membership maintains an immense sense of hope. If the past five years of Lucha's rapid emergence and momentum in mobilising both locally and around the country can be continued, it may be justified. Copyright © 2017 African Arguments. All rights reserved. Distributed by AllAfrica Global Media (allAfrica.com). To contact the copyright holder directly for corrections — or for permission to republish or make other authorized use of this material, click here.